Synopsis: A Mormon pollster writes a book criticizing the views of outsiders of the Mormon Church who he believes present a wrong portrayal of the LDS religion. In his attempt to clarify, Gary C. Lawrence instead confuses the issue. The result is a book that turns out to be a false barometer for what the Mormon religion stands for while creating false stereotypes about biblical Christianity. Written in 2011—the year before two LDS Republican candidates ran for the presidency of the United States—Mormons Believe…What?! is a book that was meant to set the record straight regarding the religion of The Church of Jesus Christ of Latter-day Saints. According to the cover jacket, author Gary Lawrence “received a B.A. from BYU in political science in 1967 and a Ph.D. from Stanford University in 1972.” The public opinion pollster is a lifelong member of the LDS Church who served his mission in Germany and has held leadership positions in his church, including bishop. One person in five has attended a meeting in which a preacher or minister who was not a Mormon talked about the LDS religion, and about half of them felt the lecture contained at least some inaccuracies—the fun-house mirror, as it were. Even though it would be nice if such presentations were more accurate, I hope they continue to argue against us, counterintuitive as it may sound. The more they challenge our claims and our reasoning, the more people will wonder about our side of the story. And many will check out the facts (p. 197). …I heard many skewed perceptions and misinformation about Mormons. One—that we are not Christians—made me want to blurt out, “What part of our name don’t you understand?” (p. x). Then there’s the publicity from ministers who preach anti-Mormon sermons. But, hey, we were driven out of New York, Ohio, Missouri, and Illinois in the 1800s, and almost out of Utah, so we’re used to it. To someone who doesn’t know much about Mormonism, I’m sure this book will answer many of their questions the way a Latter-day would appreciate. 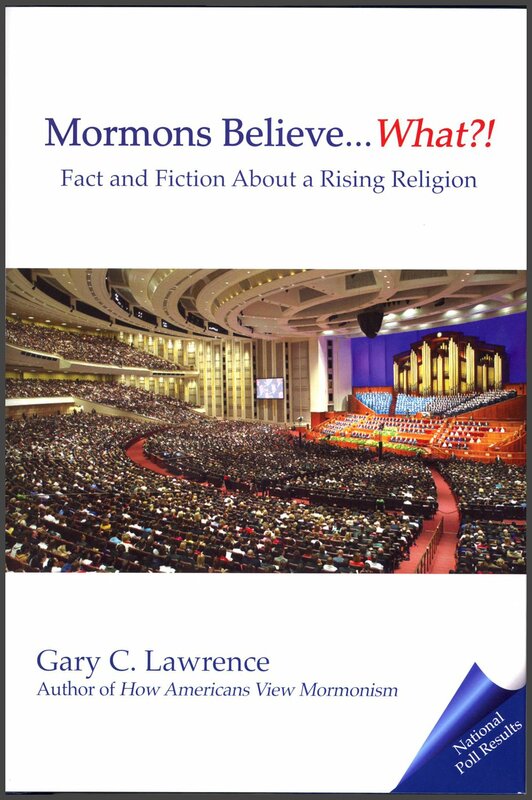 However, Lawrence’s loose style as well as weak research (only 109 end notes for a 200-page book) adds to the fictional element as he attempts to boost the perception of the LDS religion. Let’s consider eight chapters where this book gets the information wrong in a way that will easily mislead the trusting reader. “I don’t know who it was—some say Tertullian, who was the first to use the Latin term Trinitas about 200 AD (sic)—but one of the pre-Nicene fathers came up with the idea of providing a three-in-one God: three gods for the polytheistic and one god for the monotheistic. This ‘have it your way’ (apologies to Burger King) description of the Godhead grew legs as bishops converged in Nicaea in 325 AD (sic) for a special council” (p. 16). Throughout this chapter, much mud is slung at the doctrine of the Trinity with no historical evidence to support his case. (The chapter has a total of three footnotes: 1) A reference to a Barna poll; 2) a citation of skeptic Bart Ehrman who is no friend of Christianity; 3) several church history resources used by Lawrence for the information in this chapter, but no page numbers.) He so butchers the correct view of the Trinity despite the fact that he doesn’t like it when people disseminate wrong information about Mormon doctrine! Without getting too deep into the doctrine of the Trinity (after all, this is meant to be a book review), let me just tackle a few of his outrageous points. As far as the idea that the Trinity was somehow “inserted” into the Bible, how is that possible? “The Bible speaks often about the three members of the Godhead, but the word Trinity appears nowhere” (p. 18). He’s right, it’s a Latin word, and the New Testament is written in Koine Greek. He uses Bart Erhman as his source to say that the apostle John did not write 1 John 5:7 included in the King James Version of the Bible. He’s correct, as well-versed Christians would never suggest that the word “trinity” is ever used in the Bible. Lawrence goes on to say how “Trinitarians wrestle this scripture to support the three-in-one claim” (p. 19). There may be some who might attempt that, but we at MRM certainly do not. We would never use this verse to support the Trinity. The evidence in so many other passages regarding the doctrine of the Trinity is overwhelming and thus we are never tempted to use this spurious verse. I should add that Joseph Smith, out of all people, did keep this verse in his Inspired Version that he finished in 1833! Perhaps Lawrence could explain the conundrum. Lawrence says there are “three gods for the polytheistic and one god for the monotheistic. This ‘have it your way’ (apologies to Burger King) description of the Godhead grew legs as bishops converged in Nicaea in 325 AD (sic) for a special council.” By suggesting that the Trinity was created to appease the polytheists of the early church while making the monotheists happy, he insults not only the bishops who attended the Council of Nicaea but all Christians who hold to this doctrine. He is not able to correctly define what Christians believe about the Trinity, saying instead that there are “three co-equal Gods in one substance.” Three co-equal gods? If that’s the case, then it would make no sense for Christians to maintain there is only “one God”! This is what we call a straw man fallacy, creating a silly definition for the teaching of the Trinity in order to easily refute it. Instead of just making up the doctrine, Christians came together in an effort to understand what the Bible taught as truth. Yes, there was a man named Arius who turned Jesus into a subordinate god. This was the issue discussed in Nicaea. When the bishops considered the many applicable passages, they came to understand that the Bible does teach in the existence of one God as revealed in three persons. That God was not always the Father, but that there was a period when he was not the Father; that the Word of God was not from eternity, but was made out of nothing; for that the ever-existing God (‘the I AM’—the eternal One) made him who did not previously exist, out of nothing; wherefore there was a time when he did not exist, inasmuch as the Son is a creature and a work. That he is neither like the Father as it regards his essence, nor is by nature either the Father’s true Word, or true Wisdom, but indeed one of his works and creatures, being erroneously called Word and Wisdom, since he was himself made of God’s own Word and the Wisdom which is in God, whereby God both made all things and him also. Constantine lived as a pagan and died as an Arian. Hardly an admirable curriculum for “the first Christian emperor!” (Roger E. Olson, The Story of Christian Theology: Twenty Centuries of Tradition & Reform, p. 164). Historians tend to agree that, though Constantine did convene the council, he was more interested in peace among the various bishops and allowed them to figure out the biblical teaching. Check out this article that describes the history of the Trinity. In the Bible’s own pages are references to other books that were once accepted as scripture but which have been lost: Jasher, Solomon, Wars of the Lord, Samuel, Gad, Nathan, Ahijah, Iddo, and the list goes on. If these lost books happened to turn up in an archaeological dig, under what stretched rationale could a don’t-add-anything-to-the-Bible person refuse to accept them? The Bible is obviously not a once-and-final collection of all books that contains all the words the Lord gave to His people in ancient times (p. 32). Lawrence makes several mistakes. First, he assumes that today’s Christians would receive any newly discovered books (as the ones he mentions) on the par of the current Bible. Yes, Paul did wrote four (or more) letters to the Corinthians. But he assumes wrongly that these other books were meant to be taken as scripture. The books of the Bible were established in the first century (Old Testament at the Council of Jamnia) and the fourth century (New Testament canon finalized in AD 397 at the Council of Carthage). It would be wonderful if archaeologists were to ever run across any of these books, but we must understand that there were reasons why the early Jews and Christians did not hold onto these books. The writings for the apostles, for instance, were meant to be circulated. Yet only those that were written under the direction of the Holy Spirit were supposed to be circulated among people in addition to their original recipients. This would first be obvious from the universal aspect of the great commission given by Jesus to His disciples (Matthew 28:18-20; Mark 16:15-16). The written word was one of the means of preserving and propagating the gospel of Jesus Christ, a gospel that was to be preached to every creature. Just because Paul wrote a letter doesn’t mean it was meant at scripture. After all, if we found his grocery list and a thank you note he wrote to his mother, would we consider these to be scripture as well? Bible prophecies about Joseph Smith? But it is insulting and unfair to insist that the LDS do not worship the “same” Jesus as other Christians. By analogy, a Protestant might consider Martin Luther an inspired instrument in the hands of God to reform the wayward Christian Church. A Catholic might rather consider Luther to be a wayward priest who was gravely mistaken. Clearly, the opinions about Luther may differ, but it would be absurd to insist that Catholics and Lutherans are each talking about a different Luther (p. 54). When Evangelical Christians say that Mormonism has “another Jesus,” they are referring to 2 Corinthians 11:4. It says, “For if he that cometh preacheth another Jesus, whom we have not preached, or if ye receive another spirit, which ye have not received, or another gospel, which ye have not accepted, ye might well bear with him.” In other words, it’s possible to believe in Martin Luther as a person. But people disagree as to who he really was. For instance, some Lutherans might say he was one of the greatest men who ever lived, while some Catholics have said he is the son of Satan himself. Two contradictory ideas of the main cannot both be correct. Somebody must be wrong about their interpretation of who Jesus was. However, the mere worship of a god who has the proper scriptural names does not assure one that he is worshiping the true and living God. The true names of Deity, for instance, are applied to the false concepts of God found in the apostate creeds of the day. “There is but one only living and true God who is infinite in being and perfection,” the Presbyterian Confession of Faith correctly recites, and then proceeds to describe a false god who is “without body, parts, or passions, immutable, immense, eternal, incomprehensible” and so forth” (Mormon Doctrine, 1966, p. 270). As a church we have critics, many of them. They say we do not believe in the traditional Christ of Christianity. There is some substance to what they say (“We look to Christ,” Ensign (Conference Edition), May 2002, p. 90). I agree with Hinckley that Mormonism’s definition of Jesus is different from what biblical Christianity has traditionally taught. It is not insulting and unfair because the LDS Jesus is not the same as the One I worship. Yes, we have used that phrase. But a more accurate statement that we claim to be the only authorized church. If a church is the “only authorized church,” then by definition is any other church “authorized”? If a church is not authorized, then can it claim any authority? If a church cannot claim any authority, then does it have a right to say that believing in its teachings and precepts can lead a person to God? Testify that although other churches teach some truths and do many good things, The Church of Jesus Christ of Latter-day Saints is the only true church on the earth because it is the only church that has the complete gospel of Jesus Christ and the priesthood authority to perform ordinances in the name of Jesus Christ. It is Jesus’ Church. It has his name and his law, and it is led by his appointed representatives. Express your gratitude to Joseph Smith, the prophet through whom the Lord restored the true Church (Preparing for Exaltation Teacher’s Manual, 1998, p. 99. Italics in original). Jesus named His Church today The Church of Jesus Christ of Latter-day Saints. The words Latter-day show that this is the Church of Jesus Christ in a later time of the earth. Jesus said that this Church is the only true Church in the whole world and that He is pleased with it (Gospel Fundamentals, 2002, p. 102. Italics in original). Baptism into Christ’s true church by proper authority opens the doors for exaltation in the eternal kingdoms of glory, exaltation to be earned by repentance, by living righteously, keeping the commandments of the Lord, and service to one’s fellowmen” (Spencer W. Kimball, “The Stone Cut without Hands,” Ensign (Conference Edition), May 1976, p. 7). that I must join none of them, for they were all wrong; and the Personage who addressed me said that all their creeds were an abomination in his sight; that those professors were all corrupt; that: “they draw near to me with their lips, but their hearts are far from me, they teach for doctrines the commandments of men, having a form of godliness, but they deny the power thereof. The list could go on and on. The point is that, while Mormons and Protestants may call themselves “Christian,” the two religions really are not the same in any way, shape, or form. While the Bible indeed contains correct doctrine, its passages have been interpreted so differently by various denominations that an appeal to the Bible has rarely settled disputes. . . the differences in Christendom today are numerous—the mode of baptism, the nature of God, the purpose of life, church organization, responsibilities, repentance, the hereafter, good versus evil, rites and ordinances, the commandments, and on and on. It is one interpretation against another (p. 63). This is a non sequitur. Just because there are many interpretations of the Bible doesn’t mean they are all wrong. It just means all but one of them is wrong! Consider this reasoning: If the Lord overcame both physical and spiritual deaths for us and we had to do nothing but say thanks, would we be motivated to change our lives and become more Christ-like? Not very likely. Gratitude might prod us to live a better life for a while, but not as much as having the success of the endeavor conditioned upon our doing all we can to live His commandments. 15 What then? Are we to sin because we are not under law but under grace? By no means! 16 Do you not know that if you present yourselves to anyone as obedient slaves, you are slaves of the one whom you obey, either of sin, which leads to death, or of obedience, which leads to righteousness? 17 But thanks be to God, that you who were once slaves of sin have become obedient from the heart to the standard of teaching to which you were committed, 18 and, having been set free from sin, have become slaves of righteousness. 19 I am speaking in human terms, because of your natural limitations. For just as you once presented your members as slaves to impurity and to lawlessness leading to more lawlessness, so now present your members as slaves to righteousness leading to sanctification. 20 For when you were slaves of sin, you were free in regard to righteousness. 21 But what fruit were you getting at that time from the things of which you are now ashamed? For the end of those things is death. 22 But now that you have been set free from sin and have become slaves of God, the fruit you get leads to sanctification and its end, eternal life. 23 For the wages of sin is death, but the free gift of God is eternal life in Christ Jesus our Lord. We cannot work our way into heaven, but we are expected to put in the effort to keep the Lord’s commandments. Thus it is our belief that we must live His commandments (effort), and must recognize and repent of our sins (change). Then, when we nonetheless make mistakes and cannot pay the perfect price as He did, His grace will make up the shortfall. He stands ready to extend His mercy and grace, but why should He do it for lazy freeloaders who aren’t willing to keep His commandments? So here’s the million-dollar question that Lawrence and other like-minded Mormons need to answer: Just how are you doing at keeping the commandments? After all, if a person is successfully keeping commandments, then there would be no need to repent, as pretty much every Mormon does each Sunday at sacrament service. D&C 58:43 says, “Behold, he who has repented of his sins, the same is forgiven, and I, the Lord, remember them no more. By this ye may know if a man repenteth of his sins—behold, he will confess them and forsake them.” In other words, if a person really repents, the D&C says that he will “forsake” those sins. And D&C 82:7 adds, “And now, verily I say unto you, I, the Lord, will not lay any sin to your charge; go your ways and sin no more; but unto that soul who sinneth shall the former sins return, saith the Lord your God.” What a terrible penalty for a person who repents and is forgiven, only to sin again and have all former sins return! Though the temple at the time of Christ was not functioning according to God’s original intent… Early Christian texts such as the Nag Hammadi library reference elements of temple worship and leave little doubt that the temple ceremony, with its attendant practice of making covenants or promises with our Lord, was practiced by Christ’s disciples following His death and resurrection (p. 83). The Nag Hammadi library? These are not Christian texts at all but rather Gnostic texts! They were discovered in 1945 and were written in the Coptic language and includes the Gospel of Thomas. While some, such as those who belonged to the infamous Jesus Seminar, think very highly of these texts, conservative biblical scholars dismiss its ideas. The book of 1 John certainly goes against Gnostic teachings. The differences between temple worship before and after Christ result from the fulfillment of the Law of Moses and the establishment of the higher law brought by Christ. The temple under Mosaic Law included the sacrifice of animals—unblemished first-born bullocks, sheep, etc.—as a symbol of and focus on the coming of the sinless Messiah and His sacrifice for our sins. Once Jesus Christ had accomplished this great atonement, there was obviously no need for further symbolism through the shedding of blood. Members of the church today symbolically place upon the altar a broken heart and a contrite spirit instead. Notice how Lawrence makes the assumption that the temple in Christ’s day was not functioning the way God intended. In his mind, the sacrifice of animals was only supposed to be done in the Old Testament. What would have happened in those days that would have let the priests know they were to no longer sacrifice animals? He doesn’t say. Jewish priests continued making blood sacrifices all the way until the Jerusalem temple was destroyed by the Romans in AD 70. In fact, no blood sacrifice of animals has ever taken place in Mormon temples, just a series of rituals that cannot be ascertained as having ever taken place in the Jerusalem temple. Apparently, Mormons today “symbolically place upon the altar a broken heart and a contrite spirit instead” of a blood sacrifice, even though there is no historical or biblical support to show that temple worship should have ever changed. It is an argument from silence to support the LDS temple rites today, including baptism for the dead, receiving new names, and tokens (handshakes) necessary to get past the angelic sentinels. Temple garments afford protection. I am sure one could go to extreme in worshiping the cloth of which the garment is made, but one could also go to the other extreme. Though generally I think our protection is a mental, spiritual, moral one, yet I am convinced that there could be and undoubtedly have been many cases where there has been, through faith, an actual physical protection, so we must not minimize that possibility” (The Teachings of Spencer W. Kimball, p. 539). Temple Ceremony 1842-1990, p. 110). The deeper question is this: Why don’t other Christian religions have temples—these special places, more sacred than the buildings used for general worship, where all the power and blessings that Christ provided for His followers in New Testament times can be received? Temples belong to Christianity as much as the sacrament of the Lord’s Supper, the atonement, and the resurrection. This verse was not given until the 1840s and was never seen by any of the biblical patriarchs! It was meant for Mormons. As far as the verses he gives from the Bible to support his assertion, not one of them has God directing His people to become involved in polygamous relationships. Here again Lawrence misleads his readers and says something that is not backed by the facts. Now Sarai, Abram’s wife, had borne him no children. She had a female Egyptian servant whose name was Hagar. And Sarai said to Abram, “Behold now, the Lord has prevented me from bearing children. Go in to my servant; it may be that I shall obtain children by her.” And Abram listened to the voice of Sarai. So, after Abram had lived ten years in the land of Canaan, Sarai, Abram’s wife, took Hagar the Egyptian, her servant, and gave her to Abram her husband as a wife. It was Sarai whom Abraham listened to, not God! For more on this, see here. Given the persecution of the church, there was an imbalance between men and women, and more women needed to be cared for, especially as the church transplanted itself from Illinois to the Utah desert (p. 110). If you speak to an LDS apologist regarding the issue of polygamy (the marriage on one man to multiple women) , one of the most common arguments still used is pointing to how there were more women than men during the 19th century. Wouldn’t God want these women to be cared for? Polygamy to the rescue! As Mormon pollster Gary Lawrence reports in his 2011 book Mormons Believe What?! Given the persecution of the church, there was an imbalance between men and women, and more women needed to be cared for, especially as the church transplanted itself from Illinois to the Utah desert ( p. 110). The United States census records from 1850 to 1940, and all available Church records, uniformly show a preponderance of males in Utah, and in the Church. Indeed, the excess in Utah has usually been larger than for the whole United States, as would be expected in a pioneer state. The births within the Church obey the usual population law — a slight excess of males. Orson Pratt, writing in 1853 from direct knowledge of Utah conditions, when the excess of females was supposedly the highest, declares against the opinion that females outnumbered the males in Utah. (The Seer, p. 110) The theory that plural marriage was a consequence of a surplus of female Church members fails from lack of evidence (Evidences and Reconciliations, p. 391). In Utah (1850s to 1890s), the average age of a 2nd wife was 17 (husband average age early 30s) and the average age of a third wife was 19 (husband average age mid to late 30s). The average age in the USA for a first marriage in the late 19th century was about 22. Mormon men in their 30s (or 40s or 50s) married teenagers because of the shortage of Mormon girls for extra wives. Notice that if the average age of a 2nd wife is 17, then there had to be a lot of girls only 14 or 15 or 16 in order to make the average 17 since there would have been some women in their 20s who became plural wives. Because original Christianity needed to be re-established to be the forerunner for the Second Coming of the Savior in all countries, there was a need to jump-start its growth. Read Ivans’s citation again. Polygamists were having 5.9 children per wife compared to 8 children being born to monogamists. Meanwhile, there were more men than women in 19th century Utah. Lawrence is doing nothing more than perpetuating a myth. LUCIFER: Oh, you want someone to preach to you. You want religion, do you? I will have preachers here presently. PROTESTANT MINISTER: A fine congregation! PROTESTANT MINISTER: Certainly! A man cannot preach unless has been trained for the ministry. PROTESTANT MINISTER: Yes, that is what I preach. LUCIFER: If you will preach your orthodox religion to these people, and convert them, I will pay you well. PROTESTANT MINISTER: I will do my best. Notice how Lucifer made an arrangement with the pastor who responds by saying how he “will do (my) best” just after he was told how he would be “well” paid. What is the image? That pastors and priests were paid hirelings of Satan himself. Despite Lawrence’s admission that the “full-time leaders and staff are paid,” he certainly doesn’t go into any details about how much these workers get paid. For instance, a mission president’s handbook was released in 2012 (later taken down) on the Internet detailing the financial benefits received by mission presidents. While using very conservative numbers, we discovered that mission presidents in the United States bring in benefits beginning at $100,000 per year! In some parts of this nation, that number could easily reach $200,000. While the Doctrine and Covenants says that bishops should be paid, it remains silent about mission presidents. What scriptural precedence is there that mission presidents should receive financial rewards in the six figures? Meanwhile, seminary and institute teachers—those who administer classes in local areas to the faith’s high school and college students—generally receive the same salaries as the teachers in that public school district. Aren’t those men and women considered “local leaders”? And again, where does the D&C say that these teachers should receive a salary/wage? It all seems very inconsistent. In early 2017, paycheck stubs for several general authorities were discovered and released on the Internet. This proves that general authorities such as apostles are making six-figure salaries, paid as wages. Check out this article titled “Mormon Business: Paying the Church’s Unpaid Clergy” showing how LDS general authorities are compensated for their time and efforts. While some might argue that what they make is little compared to CEO’s of private companies, this is not the point. Instead, this shows that these leaders are receiving wages, even though there doesn’t appear to be any support for this in unique LDS Standard Works. Besides the fact that the D&C seems to encourage paying local church leaders, the question should be asked as to why aren’t they paid? After all, a bishop is in charge of 300-600 congregants! That’s a pretty large number. How is this man supposed to take care of the needs of these people, including interviewing his ward’s temple patrons every couple of years to see if they should keep their temple recommend cards, while managing a family (with children) and working a full-time + job? This would seem to be a pretty impossible task. Certainly the work can get done, but is the work being done well? Wouldn’t it be better if these men were allowed to dedicate themselves full-time to their work among the dozens of families they serve so they could better meet the needs of their people rather than being incredibly stressed by trying to juggle so many responsibilities at once? Mormons are free to mock the Christian clergy and the fact that many of them receive a living wage, but as the saying goes, those who live in glass houses should be careful about throwing stones. The title of this book (Mormons Believe…What?! Fact and Fiction about a Rising Religion) is nothing less than ironic. He stretches facts and, to the unknowing reader, confuses the issue. When he says that Mormonism is a “rising religion,” it’s true that it is growing. However, in the past few years since the book was written, the percentage of growth has gone down. In the April 2016 general conference, the growth rate of the church (1.7%) was at its lowest level since 1937. In fact, in 1989 and 1990, the growth rate was 8.74% and 6.19%, respectively. What happened? People are learning the history of the church, which was masked for many until recent years with the explosion of information on the Internet. Facts such as Joseph Smith using a seer stone to “translate” the Book of Mormon or bedding 14-year-old teenagers and married women have even been acknowledged by the Mormon Church, to the shock of many faithful Mormons. This work doesn’t help cut to the chase. Instead, it is meant to be faith-promoting. I imagine it has been given to doubting teens by their parents in an attempt to shut down the information they are bringing home. It is a book that is better off being out of print rather than causing the utmost confusion for so many who want to better understand what Mormons are really taught.